There are certain days that I just want to forget. Last week I had a few of those days. It seemed like everything that I baked just didn’t go right. One cookie recipe I tried twice, and both times it flopped. I’m really bummed because it sounds good, but I haven’t gotten the consistency right yet. Then on Wednesday morning I was driving the kids to school, and apparently I was in my own little world because I looked ahead, saw that the light was green and that no one was coming either direction. I think I need to drink another Salted Caramel Mocha Latte to make sure I’m really awake before leaving the house because then I was distracted by the red flashing lights at the new gas station on the corner. I even pointed it out to the kids, and said something about someone must have been speeding and got pulled over bright and early. All of a sudden my son asked me why I wasn’t stopping. The green light that I had seen had turned yellow and then red, all while I was gawking at the flashing lights on the side of the road. At that point it was slam on the brakes and slide through the intersection, or just keep on going and blow through the red light. No one was coming, so I opted for the second choice. The first thing my son said was, “I’m going to tell Dad.” He couldn’t believe I ran a red light. Not the thing I want him to see when he is just a few years away from a license himself!! The sad thing is that was the first of about 3 red lights that I went through last week. Thank goodness no one was coming through at the same time as me, and that the kids haven’t been in the car to witness these offenses. I would really have some explaining to do. Maybe I just need some refresher driving lessons. After all these driving mishaps, I needed to get in the kitchen and destress. Baking has a way of calming me down. 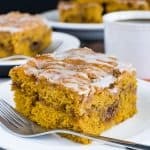 This Salted Caramel Pumpkin Oatmeal Cake or this Easy Pumpkin Crunch Cobbler are something I pull out when I need to bake a delicious treat in the fall! This morning I was feeling more like muffins though. And since it is almost fall and all things pumpkin is the way to go, I pulled a can of pumpkin out of the cupboard and made some pumpkin muffins. 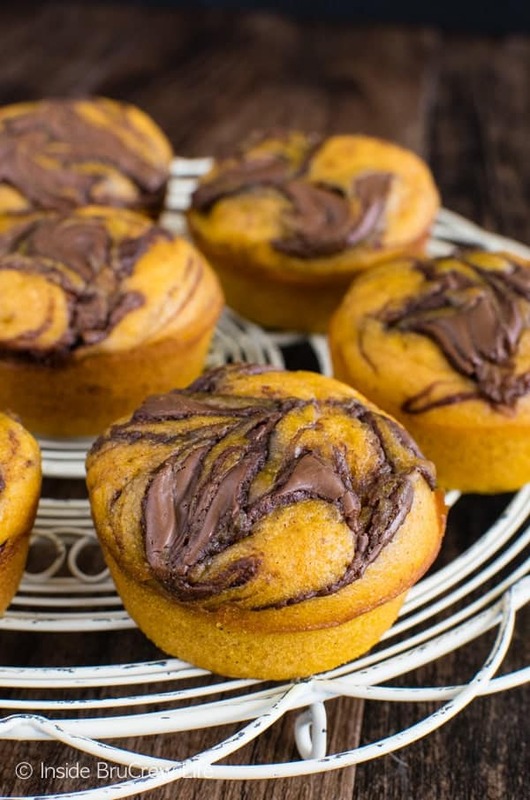 But not just any pumpkin muffins, I decided these pumpkin muffins needed a swirl of Nutella on top just like these Chocolate Nutella Banana Muffins. Spray your muffin tins with nonstick spray because you do not want them to stick to the pan. Of course, you can always use liners if you want to go that route. Mix together the pumpkin, eggs, oil, and sugar in a large mixing bowl. Sift together the dry ingredients and slowly add it to the pumpkin mixture. Spoon the batter evenly into the 18 sprayed muffin cavities. Microwave the Nutella for 20-30 seconds. Just long enough to get it warm and creamy, but not melted. Drop a small spoonful into the center of each muffin. 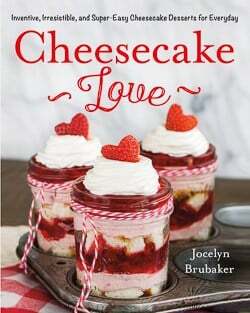 Use a toothpick to swirl it in gently before baking. Let the muffins cool in the pan for 2-3 minutes after they finish baking before lifting them out gently and placing them on a cooling rack. Store in a tightly sealed container once they have cooled completely. This will keep them soft and delicious for days. 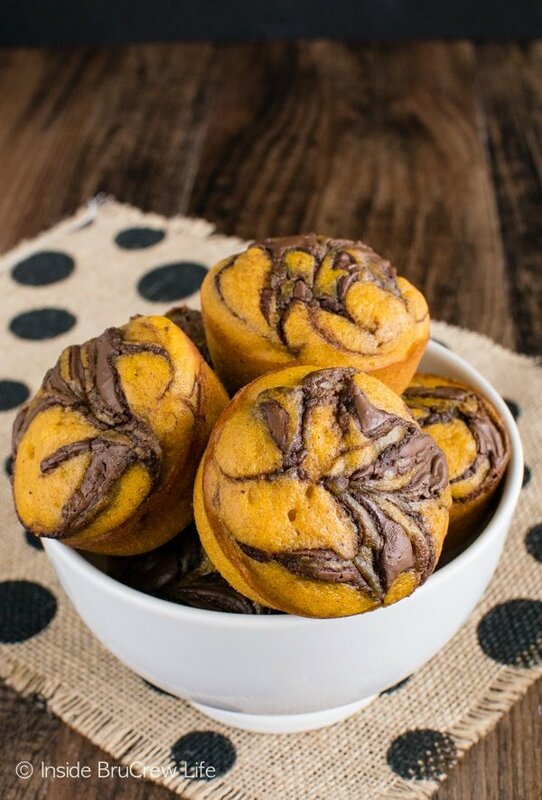 Swirls of chocolate make these soft Pumpkin Nutella Muffins a delicious way to start out any day in the fall. Preheat the oven to 350 degrees. Spray a muffin tin with non-stick baking spray. Add the pumpkin, eggs, oil, and sugar to a large bowl and mix together. Stir together the flour, baking powder, salt, and cinnamon. Alternately add the flour mixture and milk to the pumpkin mixture until everything is mixed in. Spoon the muffin batter into 18 muffin cavities. Place the Nutella in a microwave safe bowl and heat for 20-30 seconds. Stir until creamy. Drop the warm Nutella in the center of each muffin. Use a toothpick to swirl the chocolate gently on top. Bake the muffins for 20-22 minutes. Remove and cool in the pan for 2 minutes, and then remove to a wire rack to cool completely. Store in a sealed container. 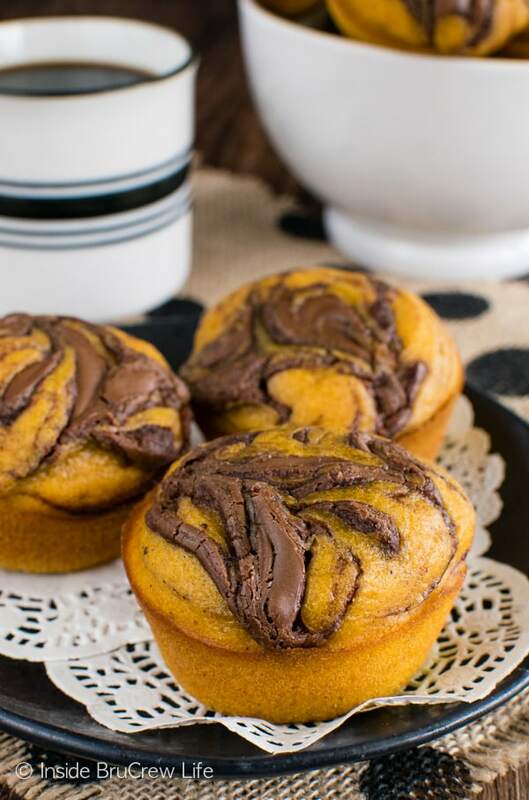 *The post and recipe for these Pumpkin Nutella Muffins was originally published October 8, 2012. The post and pictures have been updated and re-shared again on September 4, 2018. These sound tasty! I’m glad you were able to make them work! 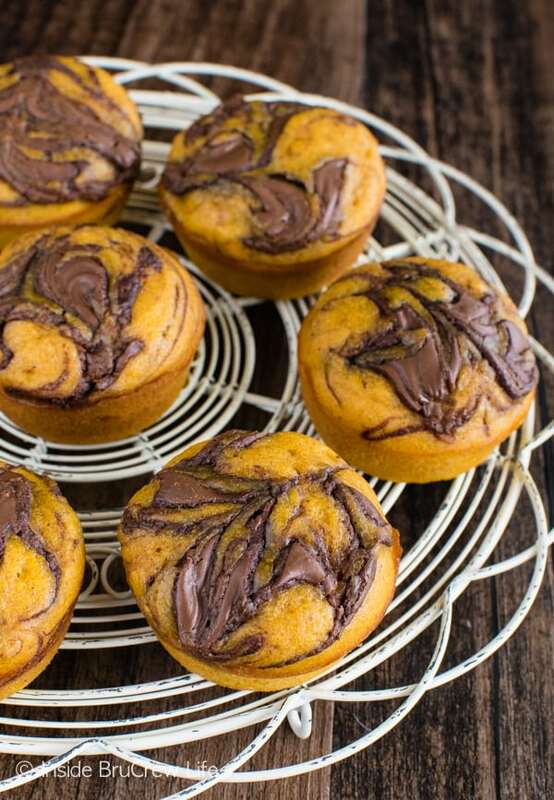 I would totally give your muffins a go … did you say there is a pocket of Nutella inside? SOLD! And those liners are absolutely adorable! I follow BruCrew on Pinterest! And I am FB fan! So glad you are safe! Sometimes, on an off week like that, it’s best to just curl up on the couch with a book 🙂 Wait, that’s what I did. These sound fantastic!!! Love the cupcakes wrappers! I saw this recipe for pumpkin muffins with a cinnamon sugar coating, just like a pumpkin donut. I would bake those in the liners! These are so cute! I’m sorry about your lame week–I have those too and they stink! Especially when it involves flopped recipes–boo 🙁 at least you got these delish muffins out of it all, despite the overflow! I would bake Pumpkin Chocolate Chip Muffins. I would bake some fun ghost cupcakes! I like Welcome Home Brands on fb. I like BruCrew Life on fb. I follow BruCrew Life on Pinterest. 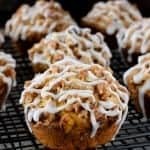 I’d bake…pumpkin muffins! Yours look soooo good and love the nutella filling! I always need liners that don’t run & bleed! 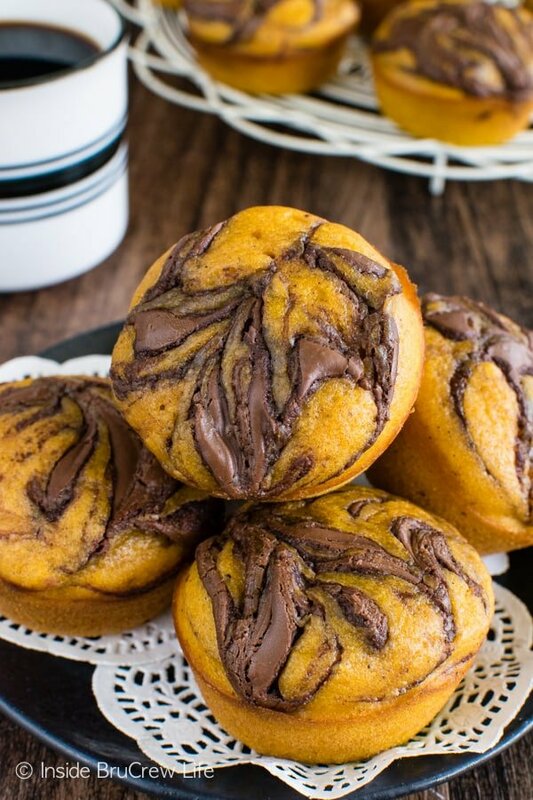 I would try these pumpkin nutella muffins! I’m crazy for pumpkin right now. 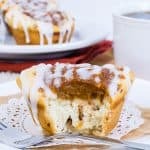 I think I’d try a clone of Starbuck’s pumpkin cheesecake muffins! Oh and I stalk (oops, I mean follow you) on FB and Pinterest and now I’m following Welcome Home Brands, just because you asked me to. 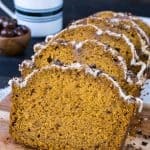 I think these look great and sound beyond delish….let’s see, I am in the mood for something with poppy seeds…maybe a pumpkin, white chocolate poppy seed something or another?!?!?! 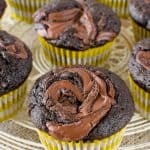 I had a cupcake overflow last week, too–must be something in the air?? That’s what I’m blaming it on. =) Overflow or not, these turned out fab–love the Nutella in the middle!! Hmmmm, you know how I feel about pumpkin…I’d have to do something pumpkin related if I won these–SO stinkin’ cute! i’d bake pumpkin muffins!! I had a horrible chocolate cupcake overflow two weeks ago. I couldn’t salvage the cupcakes at all. It was terrible! LOVE the nutella inside of these Jocelyn! That stinks that you couldn’t even salvage them…overflow is the worst!!!! Those muffins look GREAT..so glad you took a pic of whats hidden on the inside..I would have never guessed! I liked BruCrew Life on facebook! I liked Welcome Home Brands on facebook! 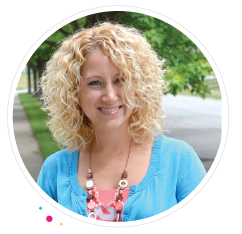 Following Welcome Home Brands on pinterest! I would make pumpkin chocolate chip muffins. I have yet to make muffins on the blog… hmmm… I need to do something about that!ASAP! Ooo I’ve never seen this type of combination before! This looks delicious, thanks for sharing! What size can of pumpkin purée did you use? 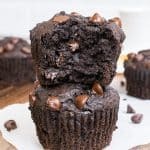 A 15 ounce can of puree has roughly 1 1/2 cups, so you will have some leftover after making these muffins. I hope you enjoy them!